The New Democrats have increased their lead over the governing Conservatives to four points according to a new survey. 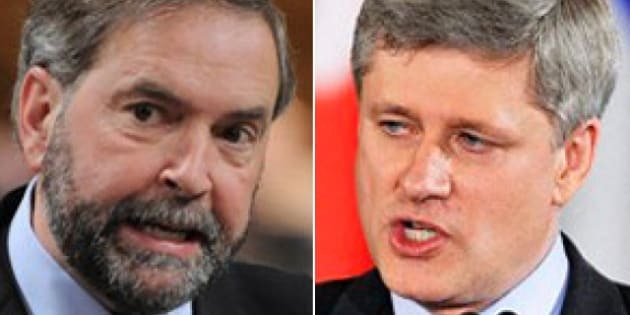 The new poll by Forum Research conducted on May 23 shows NDP support remaining steady at 36 per cent while the Conservatives have slipped one point to 32 per cent since the firm’s last poll of April 24-25. The Liberals, at 20 per cent, have dropped two points. These variations are all within the margin of error. This indicates that, despite the attacks on Thomas Mulcair’s Dutch disease comments and the introduction of the Tories' new EI plans, Canadians remain unmoved by the rhetoric. In fact, on both of these issues the New Democrats find themselves in agreement with the plurality of Canadians. Fully half of Canadians disagreed with the statement that the “unemployed should be required to take any job available, whether or not it fits their qualifications and pay expectations” in order to qualify for EI benefits, compared to 41 per cent who agreed. Though the government’s position may be more nuanced, perception is almost as important. The highest rate of disagreement (62 per cent) came in Atlantic Canada, where the changes to EI are especially controversial. New Democrats scored their best result in the region – 51 per cent – since well before the 2011 federal election. The margin of error is high considering the small sample size, but the NDP has been leading in many recent polls on the Atlantic coast. According to the survey, a “low dollar supporting manufacturing” is favoured to a “high dollar based on resource exports” in every region of the country except Alberta, a position Mulcair has been advocating since before he became the NDP leader. And in Ontario, where support for a low dollar registered highest and where the manufacturing industry has taken a hit in recent years, the New Democrats are now just one point behind the Conservatives: 34 per cent to 35 per cent, a narrowing of six points since the end of April. However, a survey by Harris-Decima taken a week before Forum’s poll indicated more ambivalence to Mulcair’s remarks on Alberta's oilsands. In that survey, 45 per cent disagreed with him while 41 per cent agreed, with Ontarians disagreeing with the NDP leader by a larger margin. As the two polls asked very different questions, the results may reveal a variance between what Canadians think of what the oil industry brings to the country and what Canada’s increasingly resource-based economy means for the manufacturing sector. In any case, this survey suggests that while Mulcair’s views may be pilloried by Western premiers and commentators in the press, they do resonate with some Canadians. Perhaps more importantly for the NDP leader’s aspirations, they resonate with enough Canadians to win an election.